Just over twenty years later, Tim’s joyful artworks and drawings involving his superhero, Laser Beak Man, have been exhibited around the world. From the Powerhouse in Brisbane to the Museum of Contemporary Art in Sydney to the Museum of Modern Art in New York, some of the world’s greatest galleries have showcased Tim and his amazing career. Laser Beak Man’s appeal is so widespread it’s gone on to inspire, among other things, an eight-part animated children’s TV series and a Broadway play in New York. 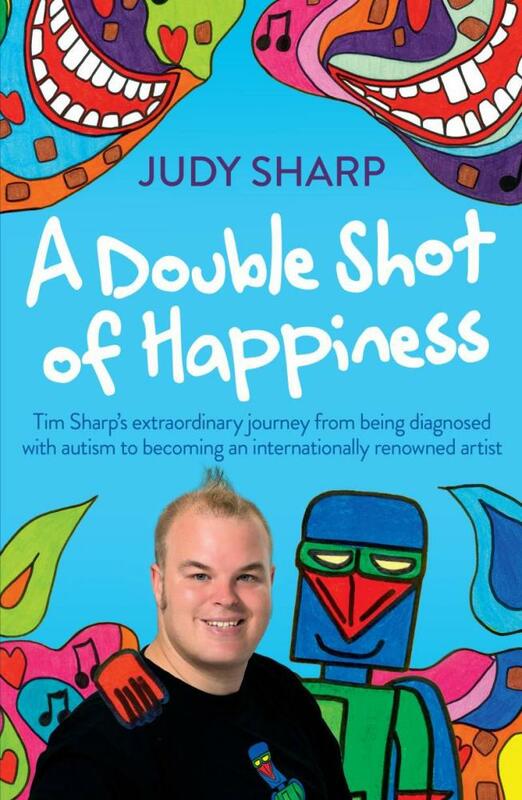 A Double Shot of Happiness (from the title of one of Tim’s favourite artworks) is Judy’s beautiful and heartfelt account of Tim’s odyssey from that terrible diagnosis to his emergence as an acclaimed artist and a fulfilled, loving and loved young man. 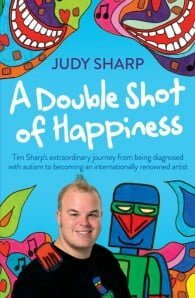 It’s a story that has involved many hurdles, moments of despair and incredible hard work from Tim, Judy, his brother Sam and all those who have helped them, but that is ultimately moving, inspiring and triumphant.